This week we have been retelling our activities from our Easter holidays by writing recounts in our diaries - we had great fun and used keywords, sounds, finger spaces and full stops to retell everything! In our maths work we are working on sharing. We have had lots of problems to try and work out. Puddles and Arthur had a basket of raisins but they needed to share them. We talked together about how we thought that this should be done - we needed to count the packets to see how many we have and then make sure that we gave each cat the same amount. It was important to make sure that when we shared we gave equal amounts, then it is fair.The maths language that we used was amazing! In our forest school work we have started to hammer. We talked about being safe with the tools and then created our own Geo boards. These are now on our challenge table to help us with our fine motor control. This week we are looking at celebrations. We are creating for our Easter celebrations - a card using cutting skills and also a chocolate nest. We will be looking at how the chocolate changes when it melts and then hardens to create the nest. We will then be counting out the eggs to add to the nest and also taking part in an egg treasure hunt - giving clues using positional language to find each egg! We will also be celebrating our work on the gruffalo. We will be having a gruffalo day. Creating gruffalo crumble on the camp fire, foraging to make pictures of the characters, retelling the story through a drama session, creating character hats and then visiting the forest for a gruffalo hunt! We have 3 ducks! They hatched and have been growing. We are making sure that they have enough water and food and are talking to them very quietly to make sure they feel safe. We will be swimming them this week so that when they go back to their mummy they know how to follow her in the farmer's pond. We have written sentences to describe the ducks and have come up with lots of words including fluffy and cute. 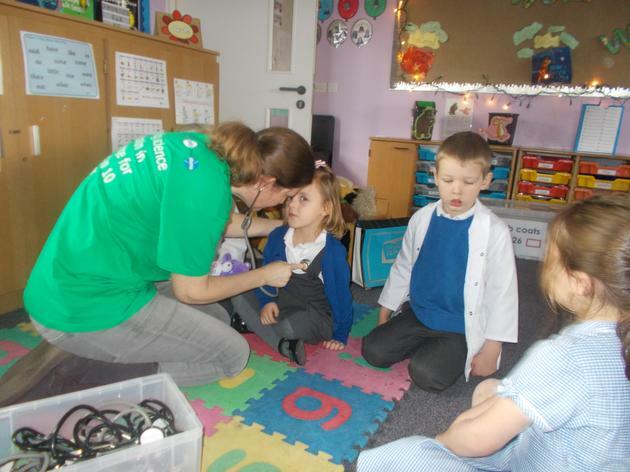 This week we are carrying on looking after them and sharing them with our friends at school. We will ensure that everyone knows how to keep them safe! 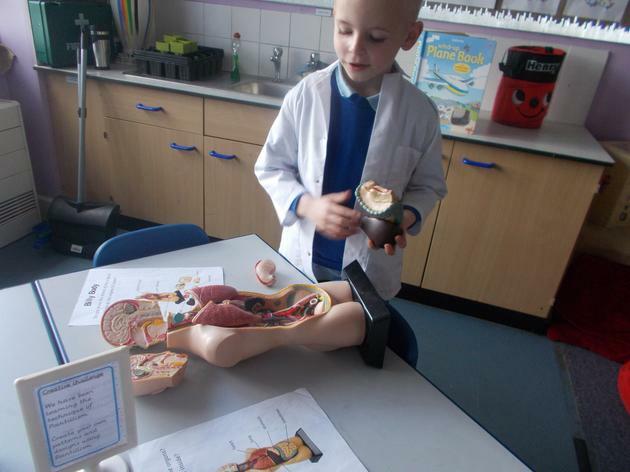 During science week we are finding out about journeys. We are using the book 'The Gruffalo Child'. We are developing our understanding of the journey that they take throughout the story and what they see. We are then designing homes for the different characters. We are also looking at shadows and the journeys that they take. We explored our own shadows in the outdoor area and how we can make them change shape. We will also be looking at the journey of a shadow throughout the day. Our main word this week is PREDICT - we have used this work in our work on shadows. We have some coloured bricks that we will be creating buildings with. What will happen to their shadows? Lots of interesting discussions took place with ideas for predictions. 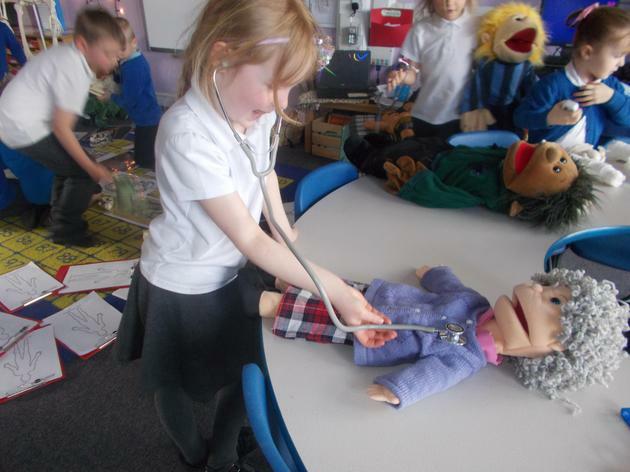 We are also having a visit from Mrs Pratt who is discussing how to keep healthy and to help us with our teddy hospital. EGGS - we will be watching the journey of the egg to hatching - what will they be? This week in our learning walk we have decided to continue with our focus on the Gruffalo. We are using our whole environment to develop our awareness of this story and to also think of ways to extend the story. We are using our construction areas to create new homes for each character and also a hideout in case we need to hide from the Gruffalo. We will be creating our own roasted fox, owl ice cream and scrambled snake meals and also a very delicious gruffalo crumble in our mud kitchens. During our forest school work we will be creating our own mud masks of the grufffao which Mr Lenton will photograph for a display. We have also decided in our busy learning to create a laboratory to develop even tastier ice cream than owl flavoured! One group of boys also spent a session using wet sand to create a gruffalo tunnel to escape the mouse. They worked so hard together, persevered, listened to each other and were so proud of the end result which was wonderful! As a class we also decided to create a gruffalo nature area for us to read the story, discuss the story and to watch out for other creatures that could be in the story. This week we are developing our story telling even further. We are working on the Gruffalo and will be using puppets and role play to retell the story using the correct sequence. We also really enjoy moving the remote control car so we have created a game where we need to move the car around the different aspects of the story in the correct order. In our maths work we are making patterns for the mouse and the Gruffalo. We will be looking at patterns around us and also created our own - even repeating the patterns! 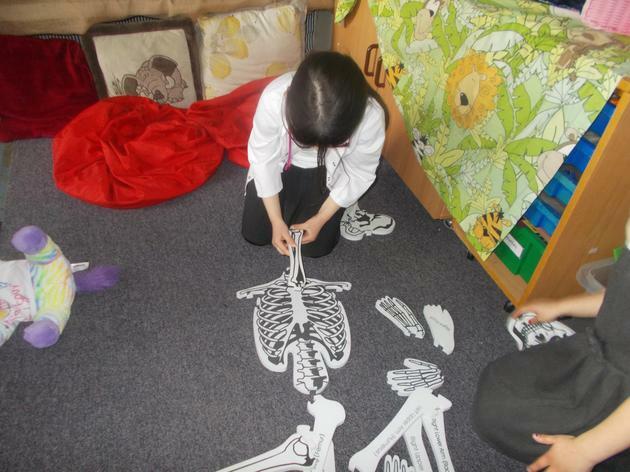 This half term we are going to develop our story telling even further through a story telling area. We will be using small world puppets and props to develop our own stories as well as retell known stories. We used a large box to create the new area and then gathered lots of resources that we felt we might need in this process. We decided to start the work with known stories of The Three Little Pigs and Goldilocks. This week we are beginning a 'Gruffalo' focus. We will be listening to the story and retelling, discussing the main elements of the story and what we enjoy. We will be using our knowledge of lopping in our forest school work to create prickles for our own playdough and mud gruffalos. In our maths work we will continue with estimating and also begin tor record our estimations to see if we are right! We will also be developing our Physical development skills using balancing with small equipment and via sewing skills - we will be creating our own stars! We are having an exciting week investigating shapes. We are developing our awareness of 3d shapes and giving clues in our guess the shape challenge. Part of a shape is being displayed on the board and discussions regarding 'what can it be?' are developed throughout our carpet time. The shape then represented an object in our classroom which helped us investigate all the different shapes that are around us. We then had a number of problems to solve sent to us by Mr and Mrs Grinling. They asked us to find which shape would make the best new boat, what shapes could create a wonderful new cottage and also which shape would be best to roll down the hill from their cottage to the beach. During our investigations we talked about the properties that the different shapes have and how they help with their uses. We will be sharing all our hard work on Thursday at our marketplace. This week we are developing our awareness of non-fiction texts to continue with our work on ice. We will look at how these books can help us with our learning. 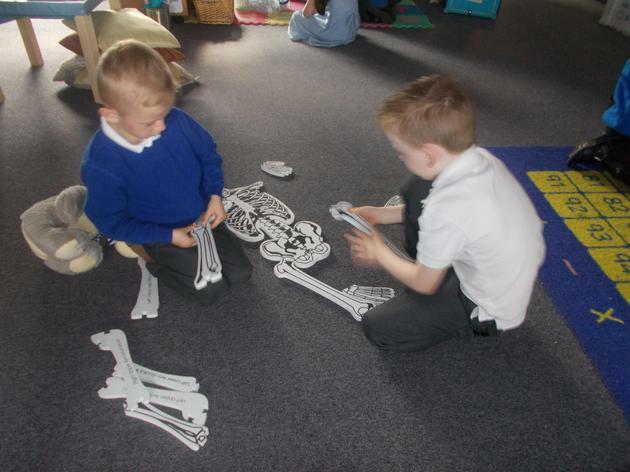 In maths we are looking at estimation and how a really good guess can help us count an arrangement of objects. We will be continuing with our sensory stories in our PE sessions and also our calming activities in our daily 5 minute sessions. Our main focus this week is to ensure that we keep safe in our forest school work. We will be lopping branches off the willow arch. We will create our own risk assessment to make sure that we are safe and keep others safe in this work. Once we have 'lopped' the branch off we will curl it and Mrs Goude will help us to join the two pieces and then with Miss Sansom we will be creating our own stars using wool added to the willow. Ask us how we kept ourselves safe. This week we are working on our growth mindset, our perseverance and resilience. We have a variety of tasks that we need to complete, working with our friends and trying hard. We have to create starts for George, find the missing number, use the zip wire to create a lighthouse with the correct height and length. We are also using the outdoor areas to create machines to catch a star. Last week we all created a pair of binoculars to take home to see if we could see the stars, We used different materials to help us. This weekend we had two members of the group who continued material investigations. . One of our class made some more binoculars, using paper mache and another member who created a lighthouse from plasticine. In our literacy work we are listening to a new story and we are learning some new sounds. We are then applying our sound knowledge in writing postcards for Iris and Isaac. In our number work we are creating our own problems and beginning to record these. We are also having our class assembly. We are retelling our favourite funny story 'The Penguin' and can't wait to show our families around our classrooms. We are starting with our new focus text this week. This is the story about how problems can be solved with determination. We will be looking at the text and how this can be developed across our whole curriculum. We will be starting our learning walks relating to this topic. In our literacy we are developing an awareness of how talk improves our learning and how we need to listen to each other too. We will then be using both strategies in our solving of problems and explaining our thinking in our maths work. 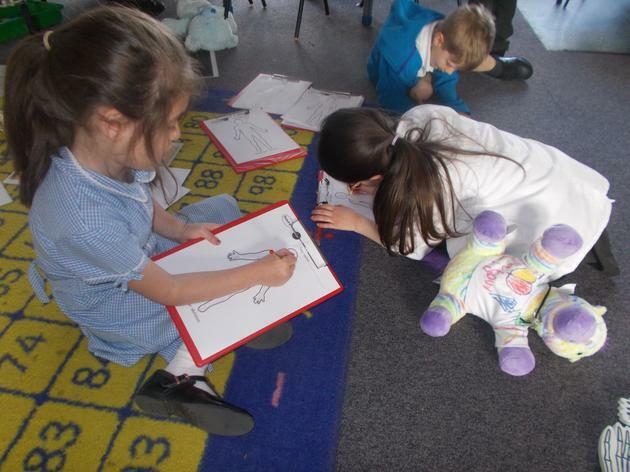 This week we are continuing with our lighthouse keeper work and developing our caption writing using Mrs Grinling's basket - choosing two objects and adding 'and' to complete the caption. In our number work we will be investigating 3d shapes - looking at their properties - how many sides etc and then discussing which shape would be best for what purpose - ie would you use a cube to replace a wheel etc. We are also developing our story telling work by using our small world props to create our own lighthouse keeper story - we will then be videoing our stories using the Ipads to show our friends. 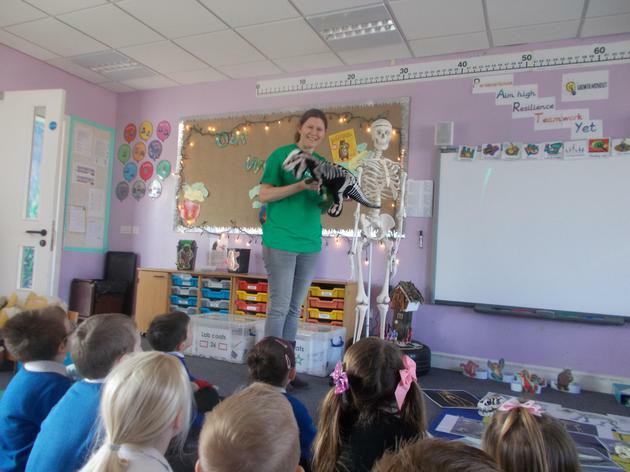 This week we are learning about a new Lighthouse Keeper Story - all about Hamish the cat. This is a wonderful story that introduces a map of where the lighthouse keeper lives. We have then decided to create our own map to use within our continuous provision. We have identified pictures of the church, chip shop, shop and school that we can add to our map and have then created our own houses to add to it. We have also been using words to describe Hamish and using our phonic knowledge to record them. We have also been solving lighthouse keeper problems involving addition - rolling a dice, counting the seagulls on each lighthouse and then adding them together. We are also continuing with our own investigations during our busy learning and are discussing these ideas with our friends during our learning walks. 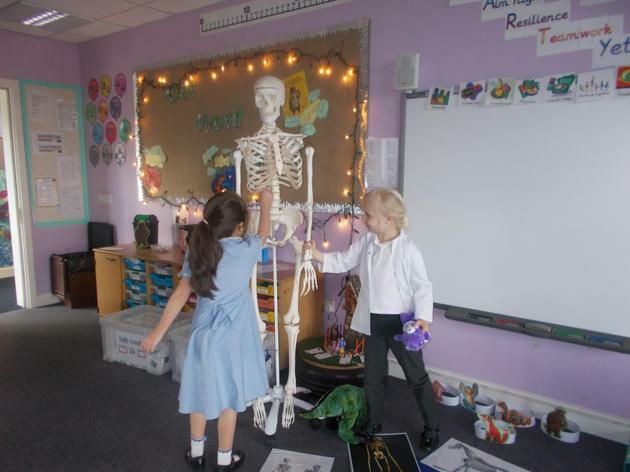 The Reception children have come back to school full of tales about their wonderful Christmas holidays. We have been writing our diaries to inform our friends about our favourite parts of the Christmas holidays and then have discussed with each other. We are using the Christmas holiday information that we worked on for our homework as a basis for our work on celebrations - similarities and differences, discussing what we did that was the same or different to our friends so thank you for completing these. We are also talking about our aims for the new term - what we want to 'Aim high' with. We are then discussing what we had to work hard with last term and what we want to do this term. These will then be on a display in our classroom along with all our growth mindset work. Forest Fridays - please ensure appropriate weather outfits - at least wellies and a coat are in school for the weekly Friday session. Water bottles - please have these in school each day. The children are encouraged to drink throughout the day. A working together leaflet will be sent home with further information about the work ahead in the next few weeks. Thank you once again for all your support and here's to a great 2019. We have had the most amazing first term at school with your children. Their ideas during their learning walks are amazing and really help us to make an individual learning experience for them all. They take turns and share, listen to each other and support each other so well throughout all activities and we will continue to develop this next year with more complex problem solving activities. 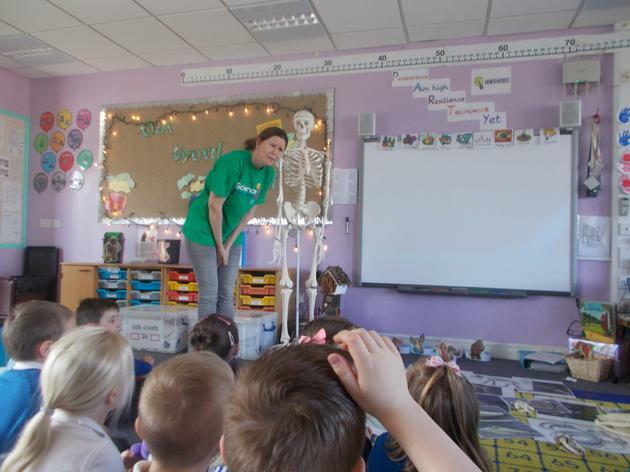 Thank you for all your work at home and we would just remind you to ensure reading books, green home link books and Friday forest school clothing are in each week, with water bottles each day. We are sending home a Christmas challenge for your children to do - something that they can then use to support their discussions during the first weeks back at school in the new year. Thank you once again and we wish you a very very Merry Christmas! This week we are continuing with our Christmas investigations through the Lighthouse keeper story. We have made the nest much more comfortable to try and keep the seagulls away and have even made mustard jelly in the sand to stop them eating Mr Grinling's food! We are also working on our own Christmas celebrations by creating stars, cards and calendars, developing our printing skills by finger printing Christmas trees and hand printing snowflakes. There is lots of glitter involved too! We have also had a visit - the naughty Elf who we have named Tangled. Each day Tangled is in a different place in our classroom and we have to find him then discuss with our friends, further developing our positional language. We have also been developing our phonic knowledge by writing Christmas lists and helping Mr Grinling with his Christmas list! This week we are developing our work on the Lighthouse Keeper to begin work on the Lighthouse Keeper's Christmas. We will be completing lots of Christmas activities, creating Christmas cards and calendars, ready to bring them home. This will begin our conversations on how different families celebrate Christmas.We will also be having a Christmas holiday challenge which will be sent home to our homes next week! We will be learning the new story and discussing our favourite parts and what we enjoyed most.. We will be focussing on words that we did not know and created our own vocabulary wall. We will be writing Christmas lists, discussing what we, or our family would really like for Christmas. In our maths work we will be solving counting and number recognition problems, using our counting Christmas stories to help us. This week we have introduced the new keyword 'I'. This has been used in our writing. We have spoken about our weekend and discussed how we speak in sentences. We then focussed on the word I, then used our sound knowledge to continue with the words that we wanted to write. We are very proud of our writing and all understand that we need to listen carefully to sounds and then relate to the correct letter. We have all then started to focus on other sounds apart from just the initial and are working very hard on this. We are also continuing with our work on light and dark and will be learning a new story - 'The Lighthouse Keeper's Lunch'. We will be retelling this and then discussing our favourite parts of the story. We are also looking at the wonderful words that are in the story. In our outdoor learning we have been making seagull traps to help Mr Grinling and have then written notices and labels for them. In our maths work we are developing our awareness of addition and also organising, sorting and discussing the buttons that Mrs Grinling collected from all her work. We are developing our cutting skills through creating nests for the seagulls in the story and will also develop this further during our forest school work on Friday. This week we will be investigating time - with discussions about night and day, light and dark. We will take part in many activities including reading 'Whatever Next' which is the story that baby bear uses a box to travel to the moon! We will be creating picnics for the owl and bear to have on the moon during our forest school work and also discuss our favourite part of the story. We will be creating our favourite day using the daily timetable and then talking about our daily routines at home. We will explore the light box by creating weaving and mixing colours and then work with a simple circuit to light a bulb. A week of celebration of our differences and similarities - focussing on our families. We have read lots of stories about how families can be different and how they can be similar. We have then created our own family paper chain, discussing who we live with and the different things that we do. During our diary writing we talked about what different things we do with our families and we have also started to create our safety circles - a group of people that we can turn to if we are worried or upset. We have then used our counting and sorting skills to organise the gingerbread families into things that are the same and different. We can't wait to share all our hard work with our families during our market place and hope that you can join us. We have worked very hard writing our diaries - listening to sounds in words and the using the correct letter to represent the sound. We then discussed with our friends what we had written. We are also using our sound knowledge to write our favourite character from Dear Zoo. We are acting out our Dear Zoo story and learning actions to help us remember. 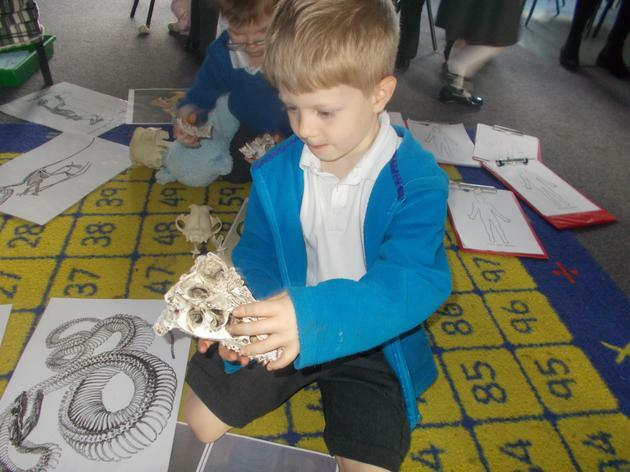 We are then developing our measure work even further by measuring the different sized animals in our tuff spot. We are also using a pile of washing from the zoo, talking about the size of different objects and beginning to order these. In our mud kitchen we are looking at the different sized containers and discussing with each other which container would be best for each animal in the story. In our PD work we have been creating the most wonderful obstacle courses which the different animals will like - we think the monkey will love all of them! We are using our holidays at half term as a focus for writing in our diaries. We listen very very carefully to sounds in the words that we want to write then match the letter to the sounds. We also focus very hard on how to form the letters correctly. Merits were given all around as we worked very hard. We enjoyed sharing our holiday news, especially any parties that we had been to. We have been very lucky to get a present of the story of pumpkin soup to share and we also then created our own soups using playdough and real pumpkins! We have then been creating different magic potions using our phonic sounds s a t p i n m d.
In our maths work we have been starting with a measure focus - looking at the words that we use to describe length and size. This is an introduction into our work that we will be doing related to Dear Zoo. We will be having an inspiration day on Friday - details will be in our Enquiry page work - have a look! Our focus text this week is Kipper's birthday. It is a wonderful story that has given us lots of ideas to develop our thinking. 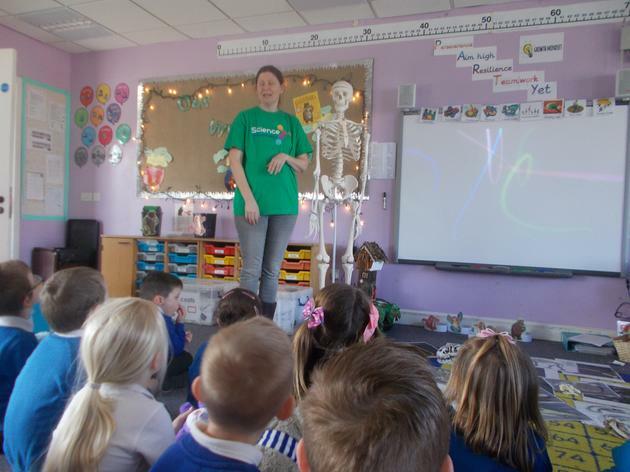 We needed to create invitations, birthday cards, presents and food to help Kipper with his party and have had great fun doing this. We have had to work very hard on writing our names correctly on the invitations and cards so that everyone knows who they are from. We have also been working hard with our numbers, making sure that we have the correct number on the cards for Kipper. We have used the outdoor area to help with our party work, using the block area to create a wonderful party zone, the sand area and mud kitchen to create food. WOW, Kipper will be pleased! During our learning walk we talked about the different ways we want to develop our learning this week. We are continuing with our shape investigations and linking them to our Not a Box imaginative work. 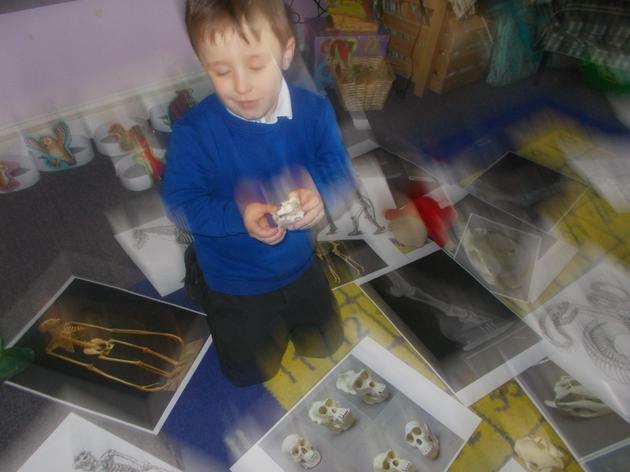 We have been working in lots of different areas of our classroom and forest school and locating the different shapes that we use or see. We have then gone on a shape hunt with Mrs Attrill and told her why we think we have found a particular shape - ie it is definitely an oblong as it has two long sides and two shorter sides. We have made some amazing creations in our construction time and have been listening to our friends about how we can make them even better. Look at some of our creations below. This week has been a shape investigation week. We have begun our shape work, discussing shapes and beginning to look at shapes that are around us. We have then started to create shape pictures and shape models. We have been discussing the reasons that we know a square is a square...... can you tell? We have also continued our not a box work with using our imagination - we have created new role play areas in Cherry classroom which will enable us to develop this area even more! This week has been very interesting - we have continued with our focus on Kipper, Biff, Chip and Floppy. We have been finding out about positional language. We then played hide and seek where we had to give clues to find the characters using positional language. We have started our enquiry this week using the story - 'Not a box'. 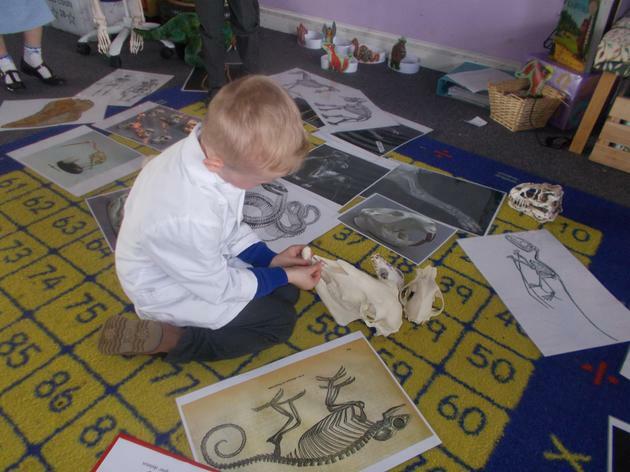 We have then carried out learning walks to discuss with each other different ways that we can develop our imagination. We are now making up wonderful stories and are hoping to develop our role play areas in the classrooms too! 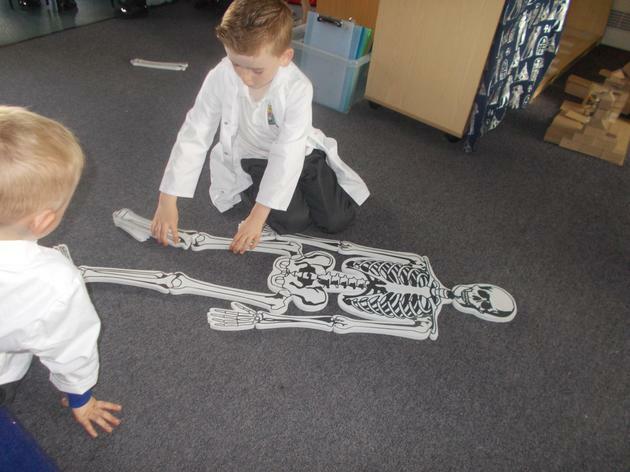 We have used the role play block area to create our own stories. 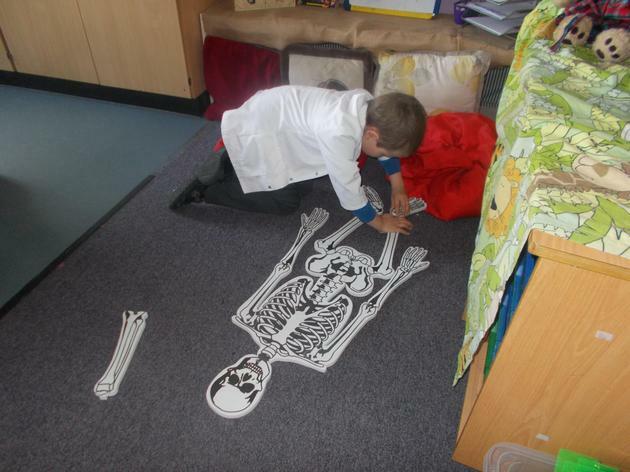 We have worked with an adult to set up a story setting and then created our own story. 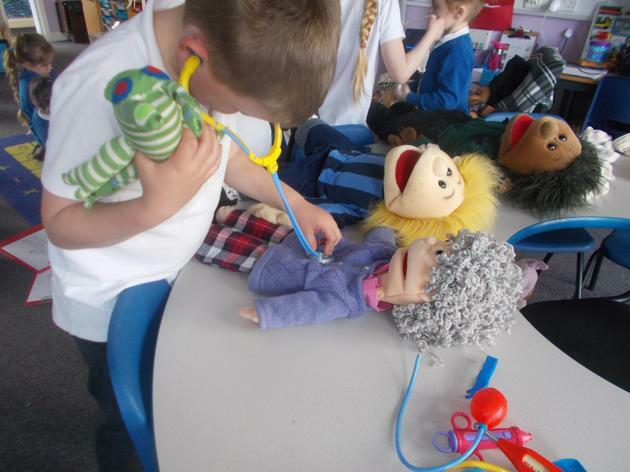 Our forest school focus this week is the story 'Toys Party'. In this story Kipper makes a very interesting cake using different ingredients! We then created our own cakes in our forest school mud kitchen! It was great fun. Look at the weekly news to see what we did! We have had a very very busy week. We have started to find out all about the characters in our reading scheme. We have met Kipper, Biff, Chip, Floppy, Mum and Dad. They are all very funny! We then read a book and were super story detectives, using the pictures for clues to tell the story about Kipper's first day at school. Did you know that he didn't like it at first and then really enjoyed it and didn't want to go home! We also learnt about how to use the computer to help us with our reading by working on the Oxford Owl website. It is very good when you can hear the person read the story and we check that they were right by using the pictures. 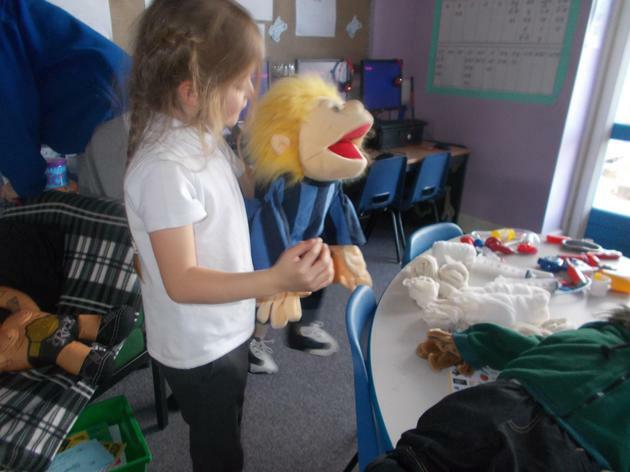 We have also been teaching the puppet to count carefully - we have told them different strategies to help with counting, especially by being very careful, saying out numbers and pointing to each object one at a time. The puppet is getting much better now! We also started our forest school work and have really enjoyed learning in this area. It was very exciting finding all the secret passages to get into the den and the mud kitchen is amazing. It has been a very windy week so we have been extra careful in the outdoor areas and have also made kites and had lots of fun with bubbles. Phew! What a very very busy week! First week of full time! WOW we have worked really hard this week. We have created artwork for our allotment art celebration piece that we are doing with the whole school. It was great fun. We have especially enjoyed being with all of our friends. Our new classrooms and outdoor environments are very exciting and we have been excited to try all the activities. We have shared our favourite activities with our friends. We particular liked the trikes, water area, sand pits and computers. We have also been working hard with our listening skills and in particular listening to our friends and learning new number rhymes.